Three years ago, "Pirates of the Carribean" was the hit of the summer. I remember walking into my local movie theatre expecting to have all of my childhood memories of the ride imitated on the screen, nothing more. I was shocked to find that the movie wasn't just a cheap advertisement for the ride, but also stood on its own as a swash-buckling comedy classic. "Pirates" is this generations "Raiders of the Lost Ark". If the orginal was Raiders, then "Dead Man's Chest" is the "Temple of Doom" of the franchise. Both films have moments of creative genius, but both failed at bringing a darker tone into the mix. In "Dead Man's Chest", the darker scenes not only make much of the film stumble about like a drunken sailor, but also makes the entire film feel like it's suffering from multiple personality disorder. First, lets look at Davy Jones and his crew. While they're impressive works of CGI mastery, they just come across as lifeless pieces of computer wizardy. Davy Jones is quite an achievement, but we didn't fall in love with Gollum becasue of how much detail was put into his finger nails. Audiences loved Gollum because of the character under all the pixels and polygons, not just because he looked cool. 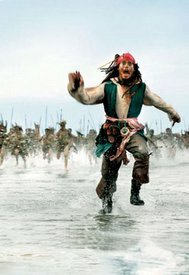 Furthermore, Davy Jones is just downright dissapointing compared to the charismatic performance Rush gave as Captain Barbossa in "The Curse of the Black Pearl". The writers owe me a SOUL! Apparenlty, the writers don't understand the words tension and build up. For example, you not only see the Kraken slaughter an entire ship early on in the film, but you're also treated to another scene nearly identical to it later in the movie. YOU DON'T SHOW A CREATURES FULL POTENTIAL DURING THE FIRST HALF OF A FILM!! What made the movie "Jaws" such a success was because you didn't see the entire shark until much later in the movie (I think everyone invovled in the production should have taken notes from Lucas and Speilberg). Two words: huge dissapointment. The Kraken is about one-tenth as creative as the above drawing. Not only is there no tension throughout, but they also took my favorite characters in directions I felt to be degrading. I really didn't like the movies failed attempt at a love triangle (which are usually awful to begin with). 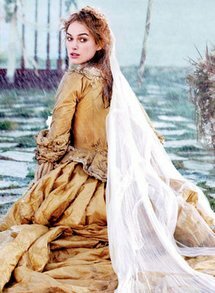 The entire thing basically destroyed Keira Knightly's character, and felt completely out of place in a "Pirates" movie. Another innocent victim of a "Love Triangle Attack". When will writers ever learn! On the positive side, the first forty-five minutes of the movie were exactly what I wanted from a sequel to an outstanding swash-buckling comedy... more swash-buckling comedy. I felt the same way about the three way fight near the film's conclusion, exactly what I wanted from a "Pirates" movie. Of course, the ending that followed was completely forced and depressing, leaving me with that hollow feeling I get when I'm dissapointed by a movie. It happened with "King Kong", and it happened here too. Needless to say, the sport of "Wheel Swordfighting" lasted about as long as the XFL. In conclusion, watch the orginal instead. "Dead Man's Chest" is long, overstuffed, and dreary. If you're going to see a fantasy film this summer, see "Superman Returns". Now that's a movie!! Thank you very much Dark Lady! Don't worry about the english, I'm one of the worst as far as that's concerned (you see should see me when I'm talking on AIM, it's like some kind of cryptic ancient language). LOL, thanks for the comment! I agree with you about the Kraken scenes. 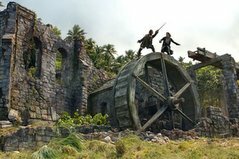 When it was destroying the Black Pearl, a large part of the plot in the first film, it didn't have as much of an impact. It was as if they were just replaying the first attack. I don't think it was a bad sequel. It was just an unnecessary one. Now we have about 4 plots going on at once! Am I the only one who thought Davy Jones was a baseball player before this movie? Yeah, I totally agree LandCow. I may have been just a little harsh in my review, since there were a few scenes that were quite entertaining. It's just too bad that the rest of it doesn't live up to the orginal. Don't you just love how they seem to exaggerate most of the action scenes? Like when it went from a three-way swordfight in the sand to a giant wheel rolling around in a forest. lawl. P.S. - Any bets that “SWING TO THE OTHER SIDE OF THE CANYON” will be a mini game in KH3? I agree with most of your review. Davy Jones wasn't too good a vilain, but I have a feeling he'll be better in the next one. As for the Kraken, I strongly disagree with that, the wya it diestroyed all th ships made it seem like it was immpossible to beat, so the writers knew what they were donig there IMO. And as for the love triangle, I feel it was necessary to show that she was ment for Jack, since she always wnated to be a pirate sine she was a kid, poor Will though... Other than that, I agree with your review. Yeah, I just don't entirely agree with the love triangle. I can see why they put it in there, but it just doesn't work for me (maybe because I'm constantly looking at the age gap between the two characters). Although, I still think that Will and Eliz will end up together, so I'm not that worried. Nice review. You've got a lot of good points here. By far my favorite scene was when they were fighting on the wheel, that just made me laugh and laugh and laugh. Glad you liked the movie Rikusgamer!